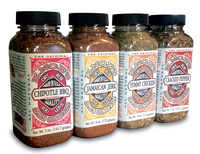 Knox's Spice Company - Quality Gourmet BBQ rub, is the sole owner of the information collected on this site. We will not sell, share, or rent this information to others in ways different from what is disclosed in this statement. We request information from you in our checkout area when you place orders on our site. During checkout you must provide your credit card number and shipping address information. Please note that Knox's Spice Company does not store your credit card information. During the checkout process, your purchase information is securely forwarded to the bank for credit card processing. The information sent to these vendors is not used beyond the approval process, and no credit card information is available to Knox's Spice Company upon completion of the order. In order to participate in Knox's Spice Company - Quality Gourmet BBQ Rub sponsored contests or sweepstakes, you will be required to provide us some information. Participation in these contests is completely voluntary and you have a choice whether or not to disclose this information. The information you give us is not distributed to other third parties. Information requested may include contact information (such as name, email address and shipping address), and demographic information (such as zip code, age level). Contact information will be used to notify the winners and award prizes. A third party may manage contests and this third party is not allowed to use the information you supply us for any other purpose except to manage the contest. Prizes are provided directly from Knox's Spice Company - Quality Gourmet BBQ Rub unless the contest is being sponsored by a merchant or other specified third party. In this case, the prize will be awarded by the merchant or third party and the information you provide will be shared with them. From time to time we may request information from visitors to our website via online surveys. Participation in a survey is completely voluntary and you have a choice whether or not to disclose any information. Information requested may include contact information (such as name and email address), and demographic information (such as zip code, age level). Survey information will be used for purposes of monitoring or improving the use and customer satisfaction of our site. Knox's Spice Company - Quality Gourmet BBQ Rub uses a "Contact Us" link located on every page of our website to allow you to contact us directly with any questions, concerns or comments you may have. We read every message and do our best to reply within 24 hours. The information you provide in these emails is used to respond directly to your questions or comments you may have. Knox's Spice Company - Quality Gourmet BBQ Rub does not use the email address you supply us for any marketing purposes. If you have agreed to purchase products from Knox's Spice Company - Quality Gourmet BBQ Rub we will not provide your name, postal address, telephone or your email address to any other party. Our website takes every precaution to protect your information. When you submit sensitive information, that information is protected both online and offline. Website security is reviewed regularly to ensure we are up to date with industry standards and technology. Whether you're requesting information or making a purchase, we want you to feel safe and secure while visiting Knox's Spice Company. You can feel confident making purchases from Knox's Spice Company. To ensure that your credit card information is even more secure, our vendors use our secure transmission (SSL) when you give us your credit card information. They encrypt all credit card information and do not store it on any Knox's Spice Company servers. Internally, Knox's Spice Company takes extra caution to limit access to customers' information. Only a few individuals within the company are given degrees of access to customers' personal information according to job function and necessity. Access is granted to these employees through special passwords. All employees are kept up to date on our security and privacy practices. Knox's Spice Company uses our web server log files to help track the performance of our site. We do not tie the IP addresses within the log files to your personally identifiable information.